Meur a briñsez zo bet anvet Anna Danmark. Anna Danmark, c. 1605. Poltred gant John de Critz. "Her features were not regular but her complexion was extremely fair and she had the finest neck that could be seen, which she took care it should be." 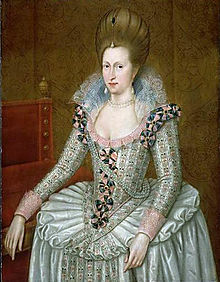 Anna Danmark (1574–1619) a oa Rouanez Bro-Skos, Bro-Saoz, hag Iwerzhon, evel pried James VI, Roue Bro-Skos ha Roue Bro-Saoz (evel James Iañ) . Eil merc'h Frederick II, Roue Danmark, e oa. Dimezet e oa da 14 vloaz, e 1589. Tri bugel he doe, en o zouez ur mab a voe roue evel Charlez Iañ. Goude ur pennad ez eas fall an darempredoù etre an daou bried. ↑ Observation by a lady of the court. Williams, 181. Kemmoù diwezhañ degaset d'ar bajenn-mañ d'an 25 Her 2016, da 13:38.